JUST REDUCED!! Don't miss out on owning your own little piece of PARADISE! Exquisite custom built 3 story modern Victorian pool home on 9.774 acres. Approx 630' frontage on St. Johns River. Stunning views from almost every room in the house. Complete privacy & tranquility is reflected within this paradise. 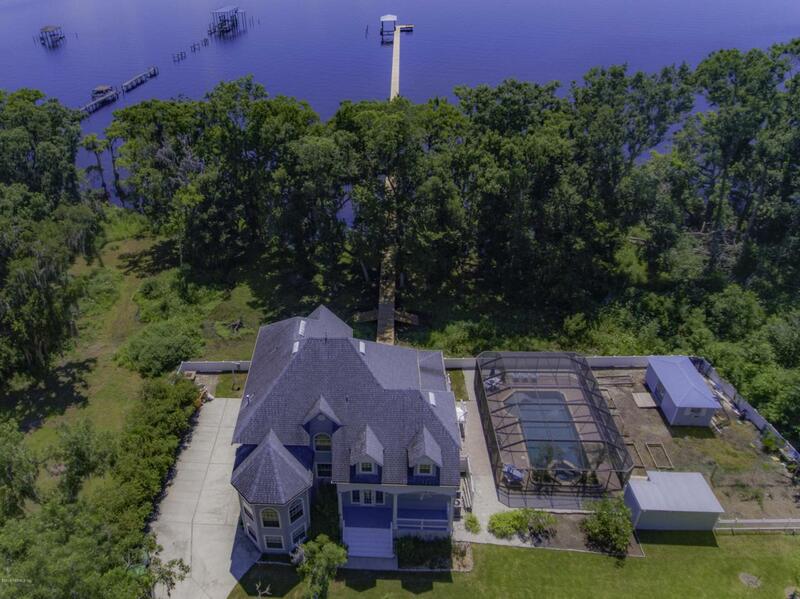 Take a stroll over the St Johns River on your brand new 635' dock with boathouse, relax on one of the wrap around porches or simply lounge in your screened salt water pool w/ spa and Pentair self-cleaning system. Custom built-ins in office. Plenty of multi-purpose rooms. Perfect layout for a multi-generational family home!3 parcels included in this listing: 17-07-27-016083-007-00, 17-07-27-016083-007-01, 17-07-27-016083-007-02 make up a total of 9.774 acres. This home is your ultimate retreat! See attached list in ''documents'' for complete list of features and upgrades. 3D Virtual tour in Photos tab. Schedule your private tour of this incredible property today!